Even in an age of online commerce, shoppers still flock to flea markets and antique shopps..Madrid’s best weekend markets are where you can vintage home decoration, new and second-hand clothes, and more treasures. 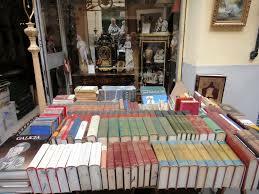 This is Madrid’s oldest and most iconic street market. 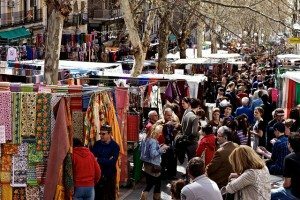 Every Sunday from 9am to 3pm, hundreds of stalls are set up in C/Ribera de Curtidores, in the Embajadores neighborhood, filling the street with life and bustle. It’s a must for tourists and locals alike, who browse through the new and second-hand clothes, costume jewelry, decorative items, vinyl records, T-shirts of bands, souvenirs of Madrid, prints and drawings. At noon it’s almost impossible to walk down the street, and two streams of shoppers are created, one heading for Plaza del Cascorro and another heading down to the Ronda de Toledo. Haggling is the norm, as are the shouts of the vendors announcing their best deals. After snagging yourself a bargain and trying some classical Madrid wafers, the best thing to do is stop off for a drink and a bite to eat in the bars of La Latina. One of Madrid’s top markets takes place in the Railway Museum. 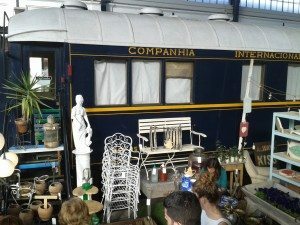 On the second weekend of every month, dozens of stalls are set up among the old train carriages and locomotives, where you can buy everything from vintage clothes and decor to organic products and classic bikes. It’s been compared to London’s Camden Market for its cosmopolitan atmosphere and its variety, and includes a section for children where, in addition to buying clothes and unique toys, kids can have a ride on a mini train and take part in games and workshops designed especially for them. When you get tired of walking around the platforms, you can have a bite to eat and relax with a beer in the large courtyard or enjoy one of the free concerts on offer. This market was created with the aim of showcasing the work of talented Spanish designers, artists and illustrators and is held on the first weekend of every month (from 11am to 10pm) at the multi-purpose space Matadero Madrid, in Legazpi. Fashion, decoration and art are the mainstays of the fair, which targets entrepreneurs in the world of design. It was originally held bi-monthly and quickly became a top leisure event for Madrid residents. More than 300 artists have exhibited their work at the MCD, where you can also enjoy free concerts and workshops. Originality and innovation are its personal trademarks. There’s a small patio where you can take a break and have a drink and a snack. This market for locally-sourced organic products takes place on the first weekend of each month at the Impact HUB Madrid co-working space and is a meeting point for the region’s producers and consumers. In response to the growing awareness of the importance of healthy eating, the market schedules culinary workshops where you can learn how to make home-made bread and cheese, how to grow your own vegetables and how to take advantage of solar power. It’s a good way for families to enjoy a day out together and discover the advantages of eating healthy produce from in and around Madrid. This market, which takes its name from the large numbers of frogs that inhabited the vegetable gardens of Los Jerónimos monastery in the 17th Century, aims to emulate the street markets of London (Portobello Road), Paris (Marche aux Puces) and New York (Soho Antiques Fair). To entice members of the public, there is also a varied cultural offer including short plays, concerts, and workshops, as well as very attractive discounts. This initiative seeks to boost local economic development and promote Madrid as a major national and international tourist spot.